006 – Newletter. 5th January 2010. Hoot! A new model for the new decade. Press the button in the base of the model and the owl flaps his wings. This simple model is available for free exclusively to subscribers. So, dear subscriber, console yourself about the lack of jet packs, hover boards and shiny silver suits in the year 2010 and download this fun little model! 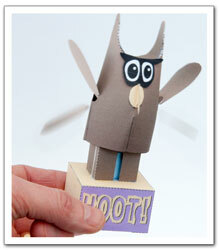 Hoot joins the growning list of exclusive paper models and projects unavailable elsewhere. 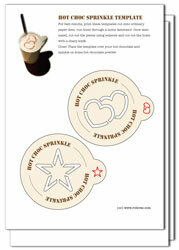 This range growing all the time and includes paper projects such as the Hot Choc Sprinkles shown here. Membership gets you free access to all downloads produced whilst you remain a member, 50% off the price of models in the store and exclusive, subscriber only content. Sign up for an annual subscription and save over £5.00.